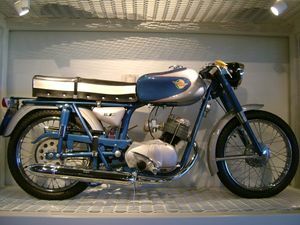 The Ducati 85 Sport was an early Ducati lightweight motorcycle. Pushrod motor pre-dates the single overhead cam design that made ducati so popular. Street racer styling was popular in Europe since the 1950s, but did not gain acceptance in the US until 20 years later. Ducati did not start importing to the USA until the early 1960s, so there are very few of these early models to be seen. This page was last edited on 9 February 2011, at 01:32.